When I was a kid the only two vegetables I would eat was corn and green beans. Occasionally my mom would try to add in a new vegetable, like asparagus and I wouldn’t touch it. Probably because asparagus from a can has got to be one of the grossest things in the world. I have no idea what compelled me to pick up fresh asparagus at the grocery store a few years ago. I guess I just wanted to see if it was any better fresh. (Obviously it is!) Now asparagus is one of the vegetables I could eat on a daily basis, especially if its roasted. 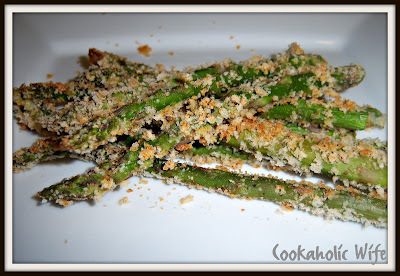 The sight of roasted asparagus sprinkled with Parmesan cheese makes my mouth water. So when this recipe popped up in my reader, I knew I couldn’t wait too long to make it. 1. Preheat the oven to 425. Cover a baking sheet with foil and place a wire cooling rack on top. Spray the wire rack with non-stick cooking spray. 2. In the first dish, whisk the egg whites together. In the second dish combine the bread crumbs, flour, Parmesan cheese and seasonings. 3. Snap off the ends of each asparagus and dip in the egg whites and then into the bread crumbs. Place on the wire rack. Repeat with remaining asparagus. 4. Bake for 15 minutes or until lightly golden. Serve immediately. Sooo good! The only thing I hate about asparagus is how quickly it gets cold. I realize that I could easily make a larger serving of something to photograph later, but I’ve gotten into the habit of photographing the food before I eat it.